Daredevil has hit Netflix in one joyous bundle, but rather than the lure of binge watching, I'm taking it slower and picking out some of the key elements episode by episode. From the first episode, I mentioned the old poster on the wall showing the boxing fight between Daredevil's father and Crusher Creel - I thought it was just an Easter egg really, but here we return to it in flashback. Crusher Creel has already appeared in a Marvel series of course - in the present day of Agents of Shield in the second series. The first episode had moments of flashback and they continue here, the lesson to be learned is that doing the right thing has consequences. Matt's father is supposed to throw the fight against Creel, but he doesn't, and he's about to make a run for it when he hears his name being chanted by the fight fans. And for a moment, just that moment, it feels worth it, because his son is hearing people cheer his dad's name. A moment of personal redemption. As he and young Matt say to one another earlier, "It ain't about how you hit the mat, it's how you get up." But that's his last moment. He is gunned down for doing what he felt was right, not what the fixer told him to. Sadly, we never see that fight on screen, leaving us wanting a great action set piece... but keep reading. Who do you trust? Why do you trust? The opening of the episode has a beaten and bleeding Daredevil in a dumpster. He is taken in by a local nurse, Claire Temple (Rosario Dawson), who patches him up, in the process seeing his face. 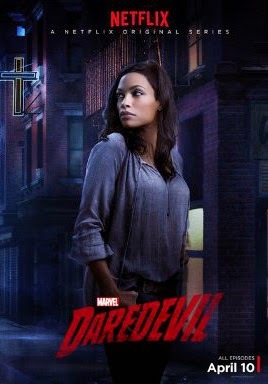 A lot of time is devoted to the two talking, and explaining why she decided to help, which in turn reflects on why Daredevil is helping. Her line of "I found a man who needed help so I helped him" doesn't wash, but the course of events burns through that until she reveals that Daredevil stepped in previously to help people and the criminals ended up in her ER, leaving her wanting to believe in what he is doing. "I know you're afraid," he responds, "You can't give into the fear. If you do, men like this win." Daredevil: Man Without Fear. As one two-hander proceeds between Claire and Matt, so does another between Karen Page and Foggy Nelson. Karen is working long hours in the office, avoiding going home after having been attacked there. Foggy doesn't realise this straight away, but it emerges as he takes her out drinking. While Daredevil is elsewhere finding support from the community, Karen is afraid of the community around her, seeing everyone as a threat. Foggy sets about dispelling that, pointing out who's who and each of their stories. Being part of the community helps to take the fear away. At least, for now. It turns out that Daredevil suffered his injuries trying to track down a kidnapped child but it turned out to be a trap to lure him in. To find the real answers, he resorts to torture - with some pointers from his Night Nurse pal as to the places that really hurt - and throws a man off the roof of a building (even if it doesn't kill him. Quite). There's no half measures here. Please, Marvel team, take a bow. I'm sitting here at the end of the show giving a round of applause. The climax of the show is Daredevil going after the mob to rescue the child. That plays out as a brutal, fantastically choreographed fight scene in a hallway, with the camera getting close up to the action, mobsters dashing past it as they rush to take on a tired but determined Daredevil. This is the kind of fight scene you might associate more with Oldboy, or The Raid - close-quarters and intense. There's only a couple of points where they could smuggle in a cut, too, so this was some incredible work to stage such a long and impressive sequence. Bravo, Marvel. Bravo.